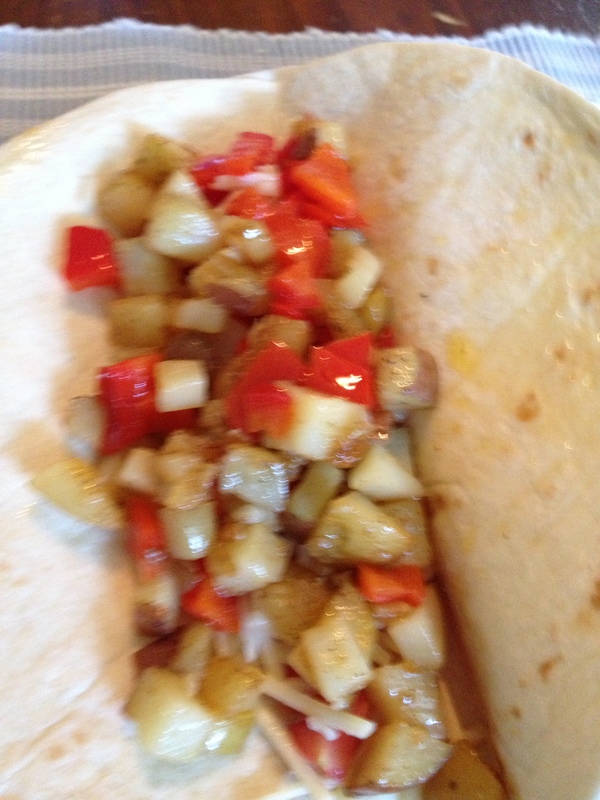 Potato and Pepper Wrap «Come Play In The Kitchen! Come Play In The Kitchen! Come Play In The Kitchen! I sauteed three small new potatoes (a combination of red and yellow), which I diced, in a frying pan with about 1 Tbsp extra virgin olive oil, seasoned to taste with salt, pepper and chipotle pepper powder, for about five minutes or until the potatoes were soft. [I usually don’t reach for the chipotle powder – I think I grabbed it on a whim after reading about how capsacin can help with colds, or with weight loss or something along those lines. In these potatoes, it really spices things up a bit and I’ll be experimenting with it again in the near future.] I added 1/4 of a large red bell pepper, diced, and sauteed another two to three minutes. Meanwhile I warmed up two flour tortillas and filled them with several sliced cherry tomatoes from the garden and a small handful of grated sharp cheddar. Once the potato mixture was done (soft enough for my taste), I scooped some of it into each tortilla and rolled them up. Yum! I wish I had thought to add some spinach or something, but maybe that will happen in the future. I may even add some diced carrots to the saute, but it was really very filling and I was satisfied enough that I didn’t have to drool over the hot dogs. why I cannot subscribe to it. Is there anyone else getting identical RSS issues?